When temperatures dip outside, you are probably looking for snowy decorations which add more winter wonderland feel to your home. Here you can find some awesome winter decorating ideas & tutorials. They would surely help you if you want to add something unique and something gorgeous to your home in this holiday season. 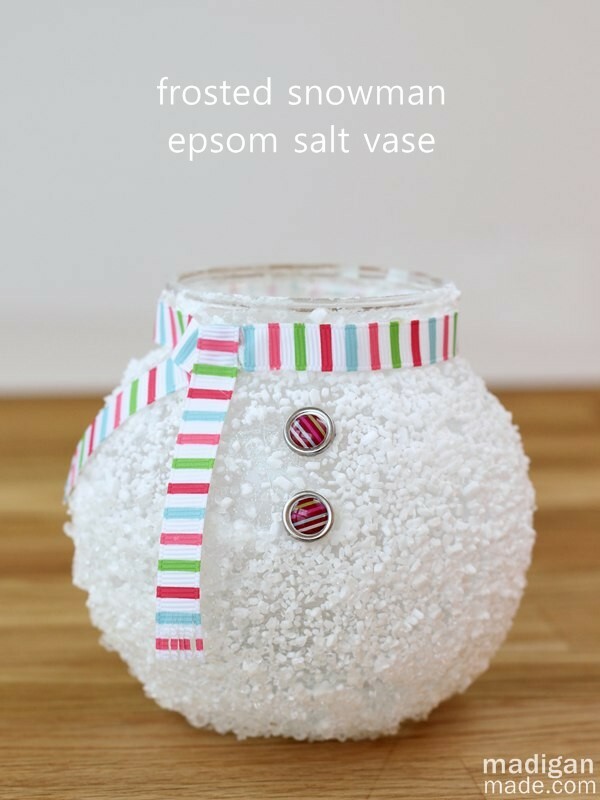 This epsom salt snowman vase is just too cute! Would be a winter home decor item or used as a great gift for teachers, co-workers filled with candy or such this winter holiday. See the tutorial via Madigan Made. 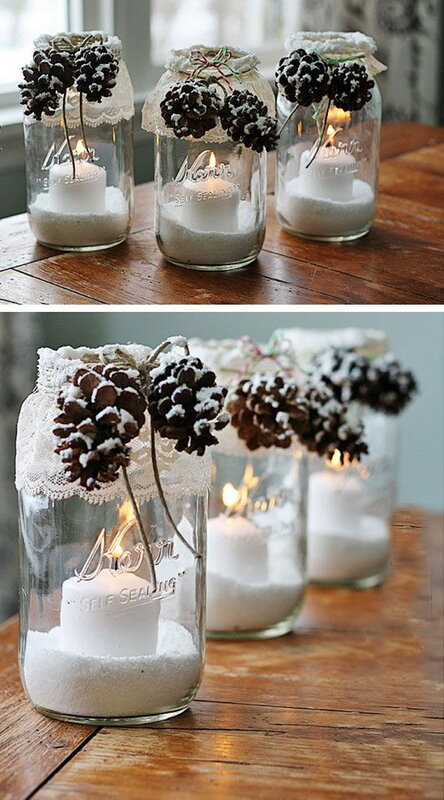 DIY Snowy Pinecone Candle Jar Luminaries. Epsom salt, glass jar, twine, lace, pinecones, candle and hot glue gun are all you need for this simple but awesome winter decor. Tutorial via Crafts By Amanda. Winter Wine Bottle Centerpiece. 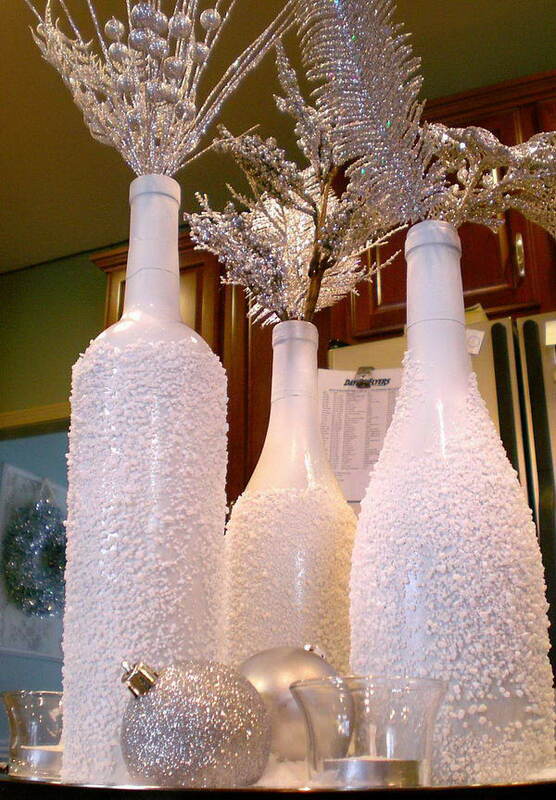 Paint the wine bottles white and silver. Simple but festive and elegant enough for the winter home decor. See the tutorial via DIY Weddings Mag. 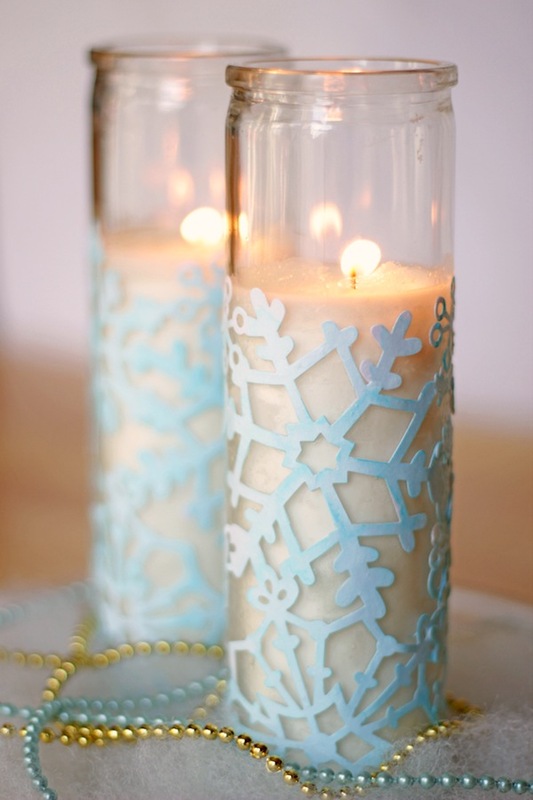 Snowflake Craft: Cute Winter Votives. High-impact and low budget winter decor. Make a nice centerpiece this winter holiday! See how to make it via Mod Podge Rocks Blog. 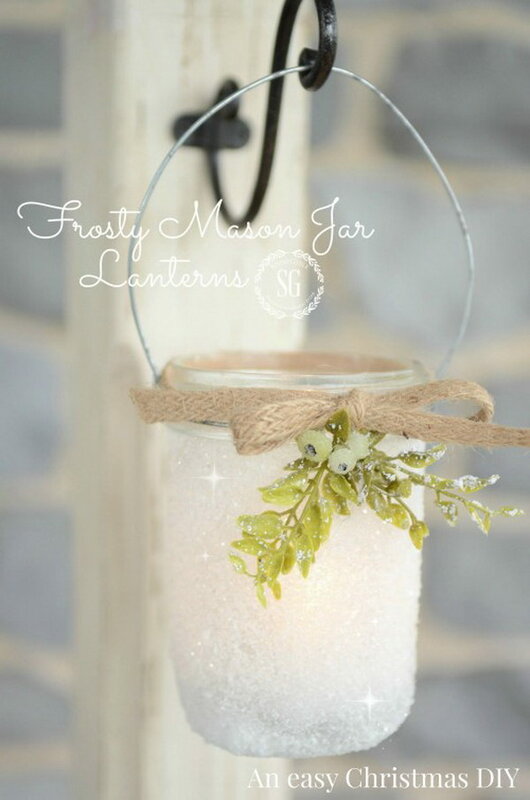 Frosty Mason Jar Lanterns. These frosty mason jar lanterns are so easy to make and looks so beautiful when hanging on doorknobs. See the steps to make it via Stone Gable Blog. 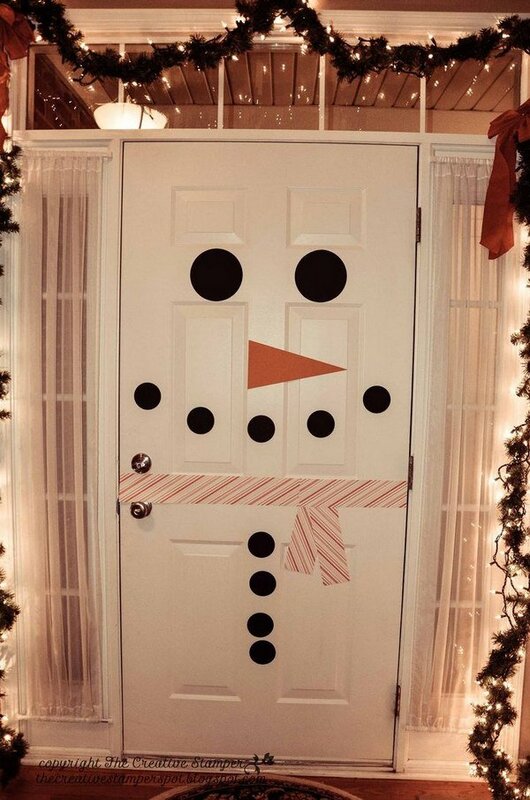 Creative idea to decorate your inside door as a snowman. So cute and easy to make it! Tutorial via The Creative Stamper Spot. 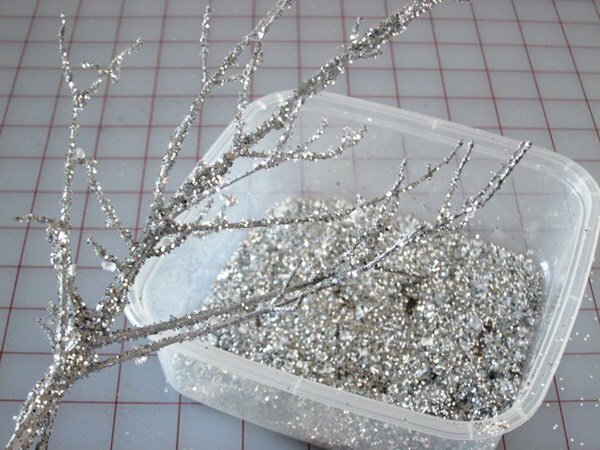 Cheap and beautiful iced branches are easy and fun to make and are great for winter season. See the tutorial via momtastic. 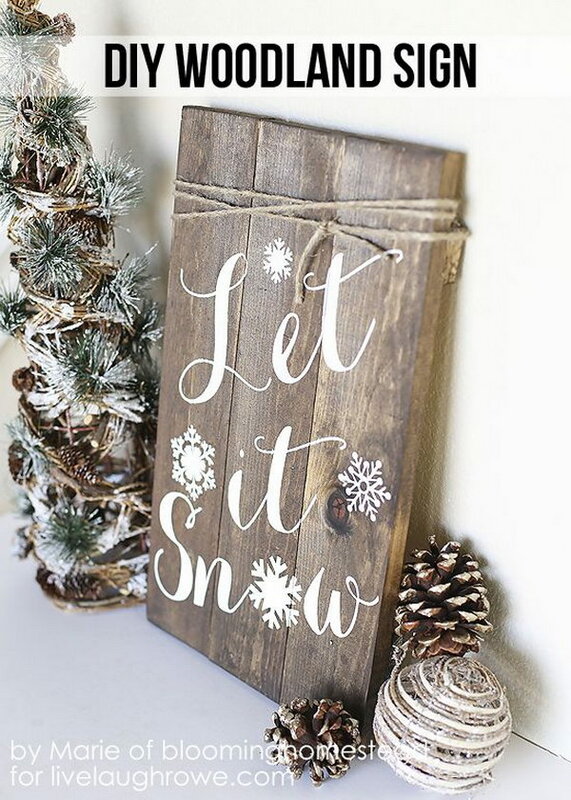 This delicate light board will add more winter wonderland feel to your home. Love it very much! I will have one for my home this winter. source. DIY Felt Snowflake Banner. Maybe it will take some time to cut out all these felt snowflakes. But it’s worth it and turns out to be a great and inexpensive winter home decor. See the steps via Holly Brooke Jones. DIY Glitter Vase: Transform dollar store vases into something gorgeous for winter wedding decor! See the tutorial via My Kitchen Escapades. 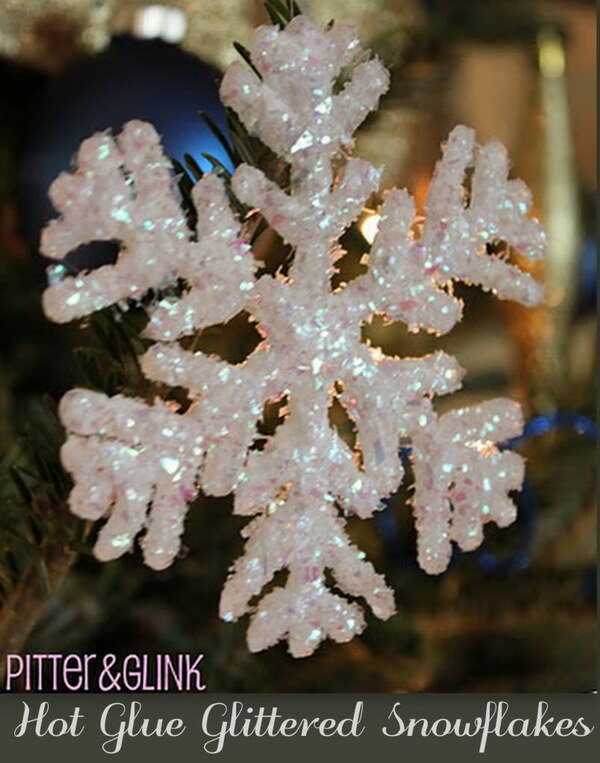 Hot Glue Glittered Snowflake Ornaments. Easy and super fun to make with your kids! Tutorial via By Stephanie Lynn. “Frosted” pine cones and branches. Love the way these ordinary and natural pine cones and branches look like. 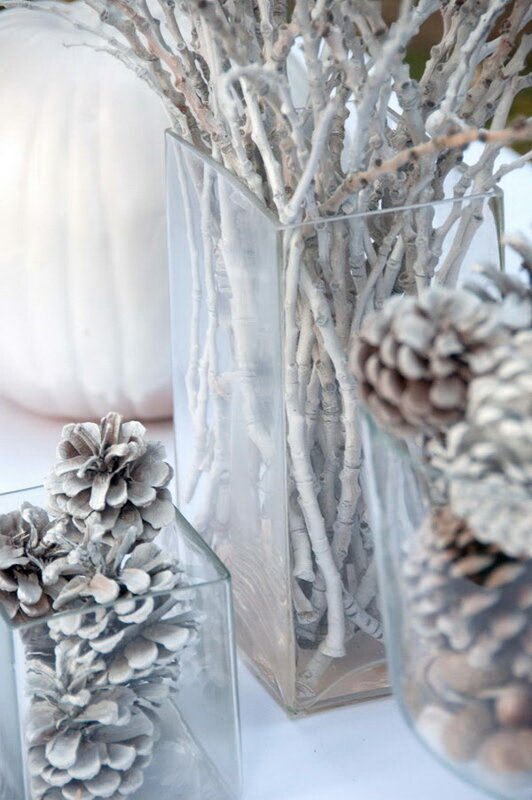 Super awesome and inexpensive winter table decor. See the tutorial via Aesthetic Nest. 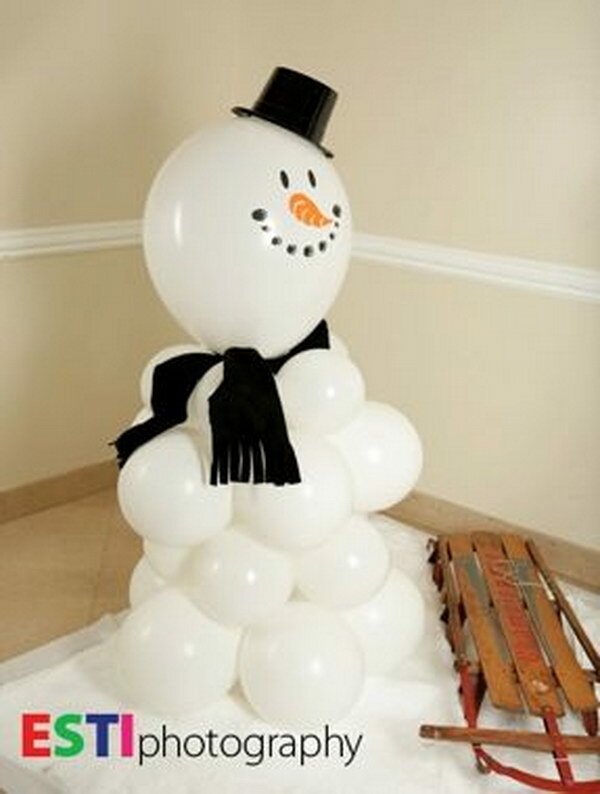 Decorative balloon snowman. 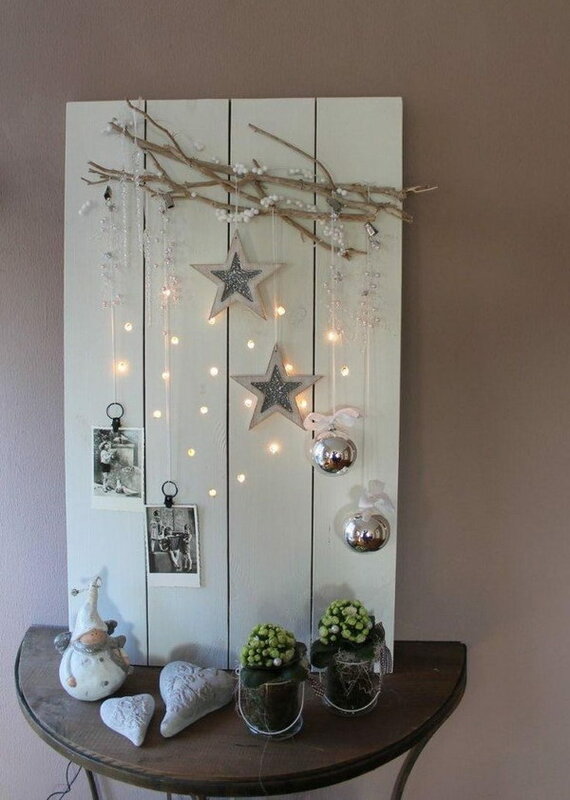 What a cute and easy decorating idea for this winter season! More via Cook Kosher. Nothing says winter more than the snowman. 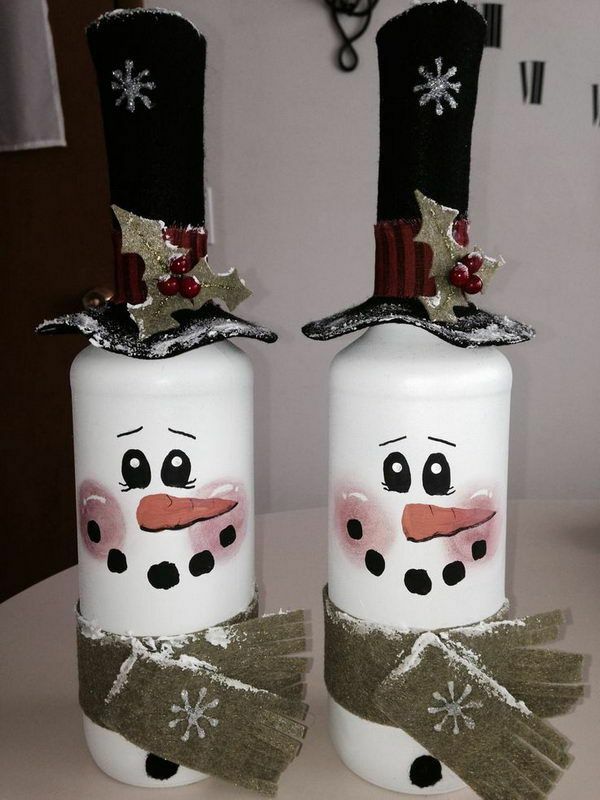 Paint and dress the empty wine bottles as snowmen. Super cute and creative winter home decor crafts. source. DIY Woodland Sign. Make this fabulous DIY Winter Woodland Sign for the upcoming winter season! Tutorial via Live Laugh Rowe. DIY Popsicle Stick Snowflakes. 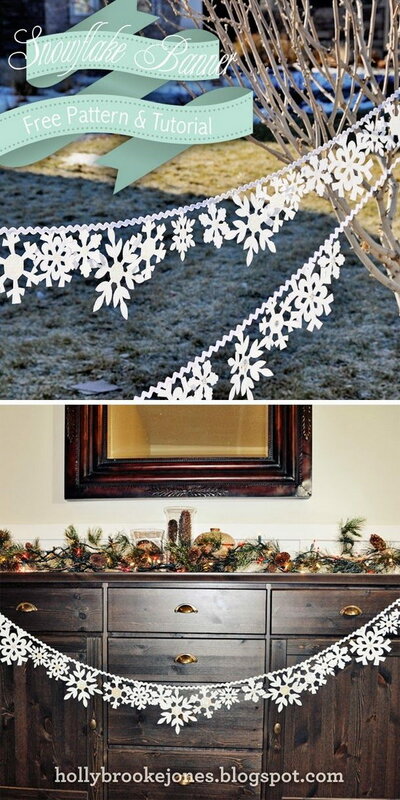 These DIY oversized snowflakes are made from popsicle sticks. They are the perfect oversized wall art for the winter decoration. Tutorial via Making Home Base. You can create these oversized paper snowflakes for a beautifully wintry bedroom wall or the ceiling. Via house and garden. 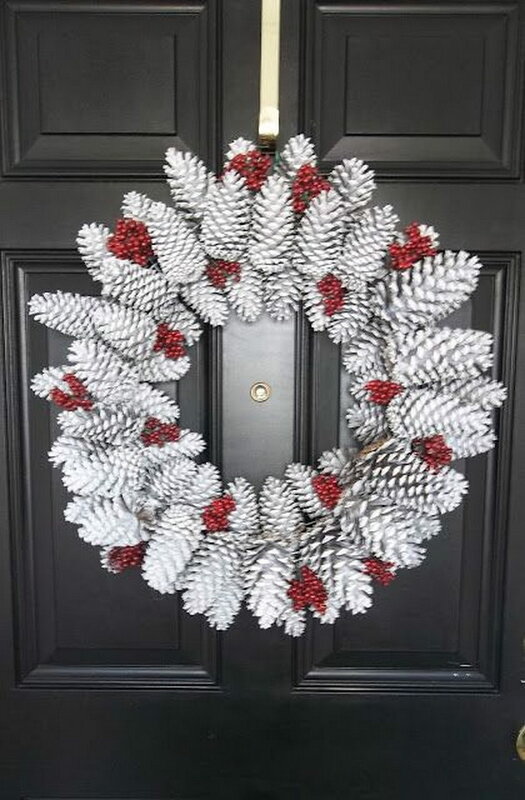 Pine Cone Wreath. Love the natural look of this holiday wreath. Easy and quick to make. It is also a DIY project that your kids can help to to make together. See the steps via Vintage Paint And More. Love the color scheme of this winter centerpiece. 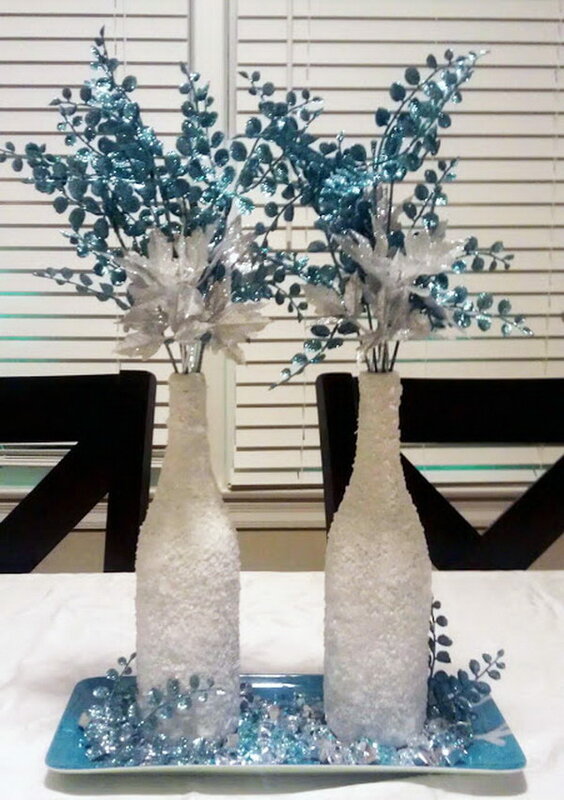 You can follow the tutorial via Monicas Creative Crafts and transformed these old wine bottles into a “Winter Wonderland”centerpiece for your dining room! Mercury Glass Look Spray Paint Pinecones. 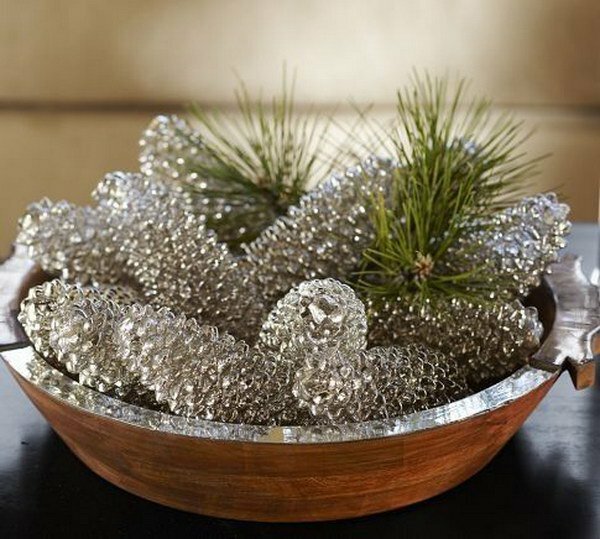 Get a winter look with these mercury glass painted pine cones. Tutorial via decorating by day. Silent Night Twinkle Light Canvas: Tutorial via Love Grows Wild. Snowmen are my favorite in winter. 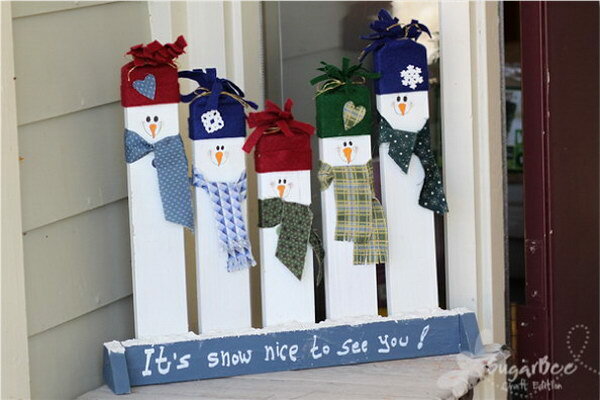 These greeting smowmen are just so cute and make a point for your winter decoration. Tutorial via sugar bee crafts.